All of the IRES participants will be required to meet at UH during the first week prior to departure for China. An orientation program will be arranged to prepare students for conducting research in China. During this pre-departure training, the program requirements and goals will be emphasized. The participants will be required to finalize all the necessary documents for traveling abroad. Meanwhile, the participants will receive intensive training on the field instrumentation of GPS (Global Positioning System) and TLS (Terrestrial Laser Scanning), as well as basic training on Chinese culture and language. A formal on-site opening ceremony and a kick-off campus tour will be organized at the China University of Geosciences (CUG) campus shortly after the IRES students arrive in Wuhan, China. The opening will be organized by their research mentors and the CUG international student office. Students will take a two-week intensive Chinese language and culture course (CHIN101) in the CUG campus. This course is designed for students that have no previous experience with the Chinese language. It aims at developing students’ elementary communicative skills and knowledge of the Chinese language and culture. Field trips to cultural and historical sites will be organized during the two weekends. The field investigation will start with a geology field trip within the Three Gorges Reservoir area led by Prof. Hanwen Zhou. Students will take a one-week field trip to study regional geology, tectonics, and visit several landslide sites in this area. Students’ research will focus on the Huangtupo landslide in the Badong County, Hubei Province (Figs. 1-2). Fig. 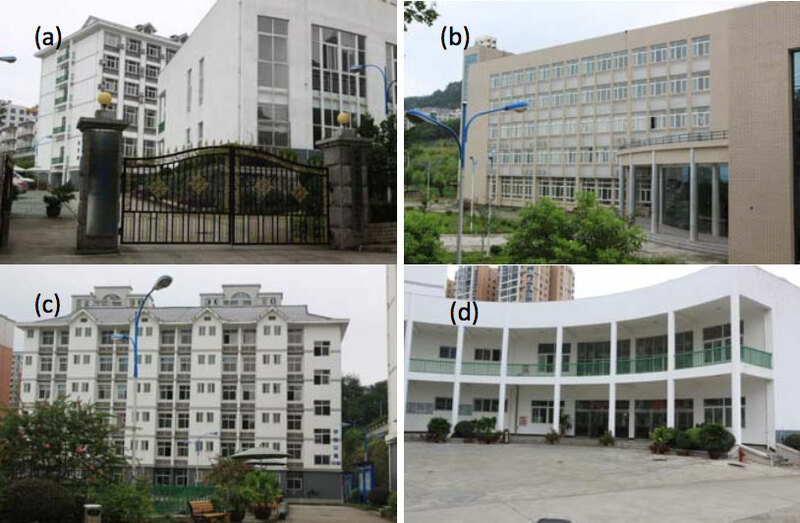 1 Maps showing the locations of the IRES activities: the campus of the China University of Geosciences (two weeks), the Huangtupo landslide and the Zigui Geology Field Camp (four weeks). Fig. 2 Map showing the location of the Huangtupo landslide. 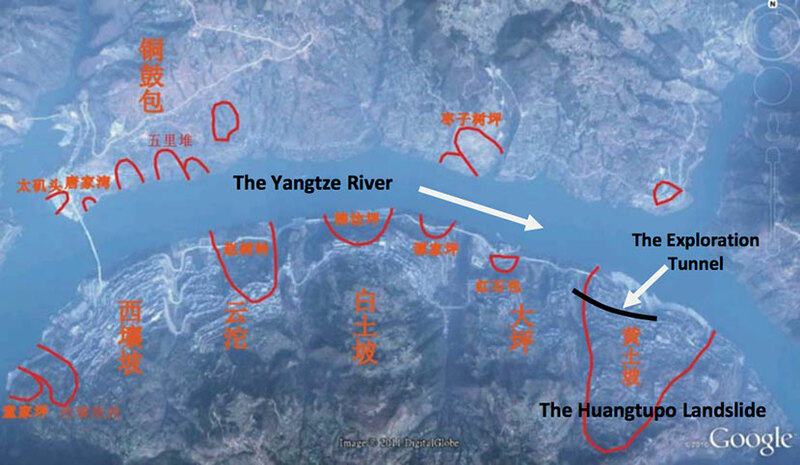 The Three Gorges Dam is 65 km downstream of the landslide. This is a joint research project with the Three Gorge Reservoir Geological Hazards Research and Education Center at CUG. In order to promote and support geological hazards research and education in the Three Gorges Reservoir area, the Educational Ministry of China has funded the Three Gorge Reservoir Geological Hazards Research and Education Center in 2008. The center is currently operated by CUG. The center is currently directed by Prof. Huiming Tang and Prof. Hanwen Zhou, the research mentors of the IRES students. An observational tunnel has been excavated inside the sliding mass across the slip zone to support research and educational activities at the landslide site (Fig. 3). An extensive monitoring system has been installed in the tunnel. The tunnel system includes a main tunnel of 908 m long with five crosscuts, called branch tunnels, and 36 observational windows. Students will be able to walk into the slip zone of the landslide and observe its movement. Fig. 3 The exploration tunnel within the Huangtupo landslide. 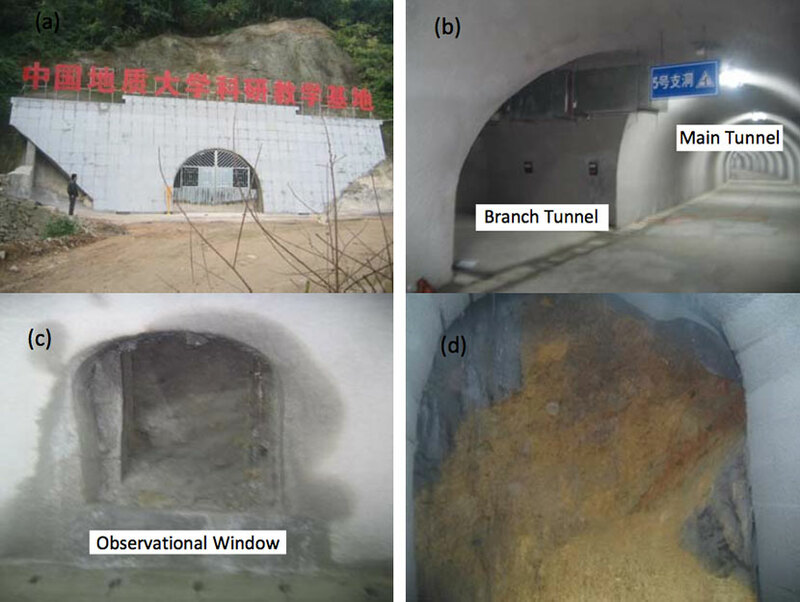 (a) Entrance of the main tunnel, (b) the main tunnel and a branch tunnel, (c) the observation windows along the tunnel, (d) the sliding strips that can be identified at the observational window. The IRES students will live in the Zigui Geoscience Field Camp operated by CUG during the field investigation period (Fig. 4). Many local and international universities have their geology field courses in this camp in June and July. A weekly seminar is organized by the Three Gorges Geological Hazards Research and Education Center located in this camp. The IRES students will attend the weekly group meetings and present their field investigations. Fig. 4 Local accommodation facility for five-week field investigation. (a) The entrance of the Zigui geosciences field camp operated by CUG. (b)The research and laboratory building of the Three Gorges Reservoir Geological Hazards Research and Education Center in the field camp. (c) Student dome in the camp. (d) Cafeteria in the camp. All of the IRES participants will return to the University of Houston to finish their research projects in the last week of the eight-week-long summer program. The students will be required to write a project report, and make a presentation on both China experience and research projects. The students will also get the opportunities to join the NSF REU program activities on campus.